Tracey Malnofski's resume reads like a who's who of the Stamping Industry. Besides being the owner and a designer for The Stamping Boutique, she's also a stamp artist for Unity Stamp Company and has also worked for InStyle Stamps, Squigglefly, and The Digi Shack. She's a professional artist and an active member of the Artist' Guild in her community.Tracey has quite a busy household with a husband, 3 teenagers, 5 mini-dachshunds and an Appaloosa mare. It's noisy, but she loves them all.Her "Boutique" has it all - fairytale, whimsy, sentimental . . . and Candy! 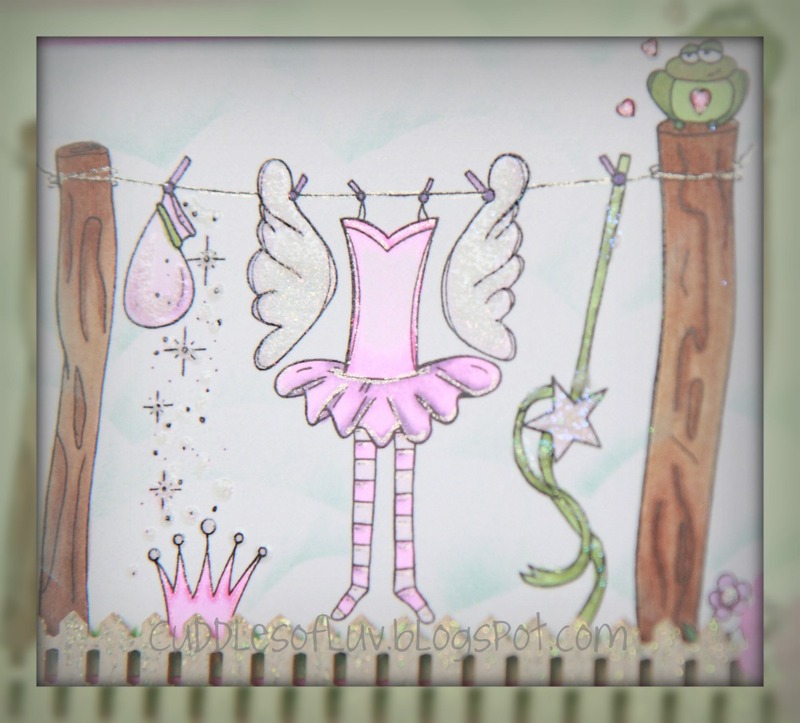 So get on over to LC blog to see more inspiration from my awesome team mates, and join our challenge to win yourself some adorable digis from The Stamping Boutique! Others- MS fence punch, Spellbinder Eyelet Circles, Memento Black Tuxedo Ink, Colorbox Chalk (brown), Versa Dew Drop (Sea Breeze), Sakura Clear Star pen, Inkssential Glossy Accents, Recollections Sparkle Powder, paper & ribbon from stash. Totally cute Mimi!! I love your clouds and the pixie dust is perfect! Oh, cute, cute, cute. The frog on the pole is a charmer. Such a cute card! Really like that image...great job!